For their first eight years of marriage, which included the birth of two children, Josh and Mae Tunks found their one-and-a-half-story Tudor in South Minneapolis suited them just fine. But Minnetonka beckoned. They grew up there. Their parents live there. They like the schools. So they started looking for a rambler with a walkout, a good footprint, and remodel potential on a nicely sized wooded lot. They found one. “We thought, sweet!” recalls Mae, despite the shag carpet and Formica countertops. Another eight years and two more babies later, the Tunks still hadn’t remodeled. “Now, we really had to do something,” she says. The siding and windows of the 1969 rambler were beginning to fail, the nishes were beyond outdated, the kitchen was dark and small. They needed bedrooms and bathrooms for the kids. They didn’t want a larger house and were uncomfortable with the waste associated with a teardown. For several months, they cut and pasted ideas for a phased remodel with Revolution Design and Build in Wayzata that would suit their “Dwell taste and Ikea budget,” she says. When homeowners are deciding whether to remodel or raze and start over, says Sid Levin, principal of Revolution Design and Build, budget is always a huge factor. “It takes a long time to take a house apart piece by piece and redo it,” he says of remodels like the one the Tunks were considering. “We’re talking about pipes, wires, walls, trim. Subcontractors are trying to make things fit and recalibrating existing systems,” especially if kitchens or baths are being moved to a different part of the house. 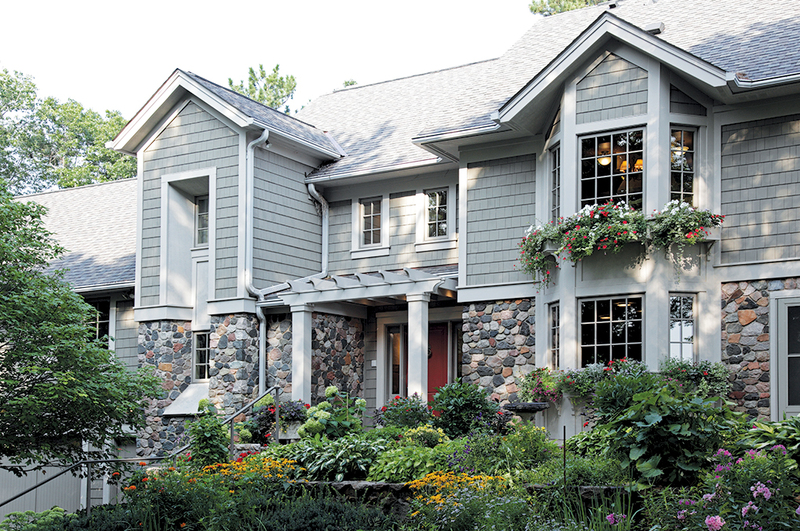 If a new roof, windows, and siding are also on the renovation list, beware the domino effect. Respecting neighborhood context and a home’s architectural history, as well as budget and structural bones, also drive the remodel or raze decision. “From a design standpoint, in some neighborhoods, if you tear down your house you’re destroying the fabric of the community you bought into,” says Gina Vozka, interior designer, TreHus, Minneapolis. Which is why Rebecca Arons and her family decided to restore their home after a re destroyed much of their 1914 house in Southwest Minneapolis. The roof was good, the siding was intact, and the front portico, though charred, was still standing. Moreover, says Arons, “the house is a beautiful example of Federal Colonial style and it’s in a historic neighborhood.” Working with TreHus, the Arons’ salvaged the grand staircase’s balustrade, extensive wood trim, and other parts of the home, which were later refurbished and reinstalled. Not only does the house now have new windows, insulation, electrical, plumbing, appliances, and hardwood floors, but TreHus changed the kitchen layout and opened the back of the house to include a new bathroom. In 1972, Dale and Jan Johnson purchased a two-story with a walk-out basement built in the 1930s on a blu overlooking White Bear Lake. In 1973, they added a two-story garage, turned the existing garage into a front entry and guest room, and renovated the attic into bedrooms and bathrooms for their daughters. “We decided if we continued to live here for a long time it would be worth it,” says Jan Johnson. And they did. They raised their children in the house amid its stone replaces, pine paneling, and wood from an old dock that went on the walls in one room. The Johnsons’ new master suite takes full advantage of lake views. An elevator serves four levels. The living space was enlarged with new windows to take advantage of bluff-top panoramas. The original wood- burning fireplace was switched out for a see-through gas replace between the dining and living rooms. A new guest suite on the first floor could house an in-home caregiver if needed. And new ventilation, insulation, geothermal heating, and LED lighting have been incorporated into the remodeled home’s traditional aesthetic. The decision to remodel or rebuild “is not a math problem, it’s a value proposition,” says Jean Rehkamp Larson, partner, Rehkamp Larson Architects, Minneapolis. In the following checklist, she outlines the primary contributing factors that figure into the very personal calculus homeowners and their architects undertake when deciding whether to renovate or teardown a house and rebuild. Historic value: If the house has historic provenance and the owners value its significance, or if the house is historically designated or in a neighborhood with historic designation. Sustainability: If the homeowners value an approach with less environ- mental impact. Reusing the structure of the house is more sustainable. Bones: If the bones of the house —the height from floor to floor, the overall form, and the location of most windows—meet the goals of the homeowner. Context: If the existing house fits into the streetscape and scale of a neighborhood, and the homeowners value this quality. Zoning: If zoning requirements to build new mean giving up a prime position on the site. Site: If the house doesn’t take advantage of the orientation, views, and location on the site. Style: If the house is a rambler and the homeowners are dreaming of a colonial. Structure: If the structure is in significant disrepair, particularly the foundation and mechanical systems. Cost: If the cost of the remodel exceeds the cost of building new and the historical characteristics are not valued by the homeowner. Bones: If the room sizes and location, interior ow, stair location, and ceiling heights don’t meet the client’s needs. Health: If mitigation of environmental health concerns exceeds reasonable solutions.